Annie has extensive experience in Civil Litigation* with particular emphasis on Family Law, medical Negligence* and injury claims*. She is an accredited Mediator and holds a Certificate in Advanced Advocacy from the Law Society. She represents clients in the District Court, Circuit Court and High Court in cases relating to Family Law, injuries sustained in accidents or through medical negligence. 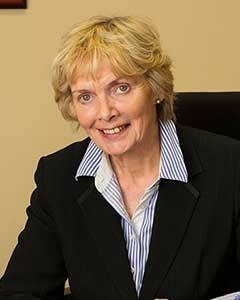 Annie is a member of the Mediation Institute of Ireland (M.I.I. ), the Family Lawyers Association, the Medical Injuries Alliance, the Dublin Solicitors Bar Association, the Northside Mediation Group and Northeast Mediators, the Association of Collaborative Practitioners. She is a Member of An Garda Siochana Complaints Tribunal and a former Chair of a Citizens Information Committee and past Committee Member of the Family Lawyers Association. She is married with children and is actively involved in a number of charities, and thinks it might not be too late to start golfing.